May 5 of this year will be the 139th Anniversary of the first edition of The New Northwest—the weekly suffragist and reform-oriented newspaper edited out of Portland, Oregon, for 16 years (1871-1887) by former teacher and dressmaker Abigail Scott Duniway. 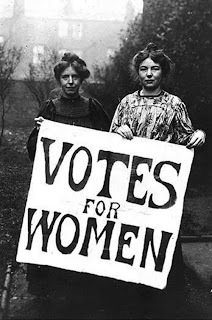 Over that time and under the motto "Free Speech, Free Press, Free People," The New Northwest published all sorts of news, editorials, advertisements, and entertainment, most of which was related in one way or another to the fight for national and international women's suffrage. 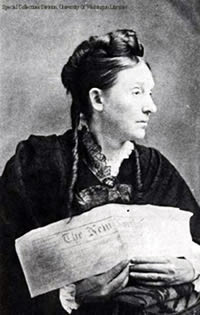 Via that four-page weekly, Duniway (pictured here) became the region's most prominent voice advocating for women's rights, and so, when Susan B. Anthony came to the area in 1871, it was Duniway who played host and travel companion. And in 1912, when Oregon became the 7th state in the U.S. to pass a women's suffrage amendment, she was the first woman to register to vote in Multnomah County. While it's not surprising to learn that The New Northwest published poetry, it is surprising to see just how prominent a place poetry occupied in the paper, as nearly every single issue had a poem or two prominently displayed on the front or back pages. In fact, it is the growing opinion of the Poetry & Popular Culture Office that Duniway's paper should occupy a significant place in the literary, as well as the political, history of the Pacific Northwest, as it provided a regular venue for home-grown or locally-sourced poetic talents—some overtly political, some made political by virtue of their situation in the paper—and published them alongside nationally-known writers like Henry Wadsworth Longfellow, Quaker poet and abolitionist John Greenleaf Whittier, and Bret Harte, thus making early Portland into a crossroads of poetic activity and establishing the Rose City as the region's poetic, if not legislative, center. Long before Woody Guthrie came to the Columbia River basin to write songs promoting the Grand Coulee and Bonneville dams, and long before folks like Theodore Roethke, William Stafford, David Wagoner, and Richard Hugo moved here to teach in university-based creative writing M.F.A. 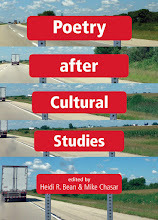 programs, Duniway and The New Northwest provided a vehicle for the region's poets to connect and make their work public. As of this posting, though—despite the paper's importance to the history and culture of the region, and despite the financial backing that's got to be there in the locally-head- quartered pockets of Nike, Adidas, and Columbia Sportswear (employees, corporations, and foundations alike)—The New Northwest does not yet exist in an easily accessible, searchable, digitalized form. 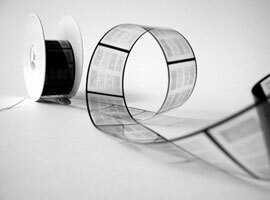 Instead, it's on these wacky, poor-quality, old-school strips of plastic that the librarian calls "microfilm," and so it's difficult and frustrating to access and at times very difficult to read. The filmic reproductions are sooooooooo bad that they won't even print out with much legibility. The very deuce is in it. How will I e'er get through it? He’s always so on Monday. Which way shall I be turning? Oh dear! the baby’s waking! Set sober men to drinking. Can’t always smile so winning? And hours of leisure double. 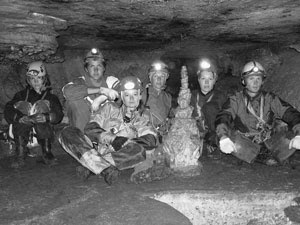 Wife, mother, nurse, seamstress, cook, housekeeper, chambermaid, laundress, dairywoman and scrub generally doing the work of six. For the sake of being supported.